Note: Rosie is posting early this week because of the holidays. Katie Rose is the sweet innocent girl of the past that starts out as an awkward teen and transitions into a graceful gal in this vintage YA classic. 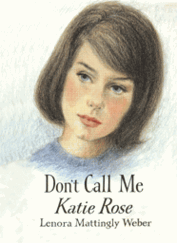 Katie Rose was the first book character to capture me into the wonderful world of reading at age 13. Nope, because current celebrities aren't portrayed as innocent these days. Katie Rose's fresh innocence and beauty is what draws me. I admired Katie Rose's ability to overcome her worries and fears and to "do the right thing" when the time came. Yes, please do. In fact, read the whole series to get a complete picture of the character's growth. A hip hip hooray for vintage YA! Here's a link to my recent book review. Aarti ~ found you through Bellezza, and left a comment there. I'm so tickled by this post, and will show it to my mom. 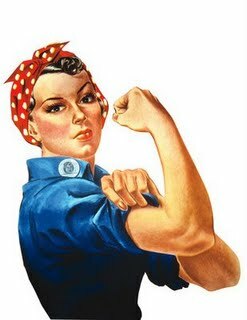 She's 91 now, and was an actual Rosie the Riveter during WWII - she worked on airplanes in Rock Island, Illinois. I know she'll enjoy seeing this, and knowing Rosie's heritage still lives! This looks like a perfect set of books for my daughter. There don't seem to be many positive role models out there in the YA book world right now...Bella, I'm looking at you!! zibilee - this will be up your ally as it is good clean fun. Hi, I just stummbled upon your blog. I'm new to the book blog world. Turns out I'm also a 20 something Chicagoan who LOVES to read. I look forward to reading more of your blog soon!